These pictures show the typical lighting options that can be placed on a new or existing enclosed trailer of any size. We have chosen the long rectangle snap-in surface LEDs for the marker lights, and the taillights and back up lights are the Brite Lites surface flange mount Ovals. Using surface mount LEDs make the installation a snap and reduce the man hours needed to put larger holes in the trailer, and help keep the full strength of the trailer. Our midship LED lights are also surface flange mount ovals. Nice way to trick out a trailer and Get Lit UP! We have maxed out the LED lighting on our trailer to promote a safe and easily seen trailer. We doubled up on the tail/stop ovals and put double white back up lights to make it safer to see when backing up. 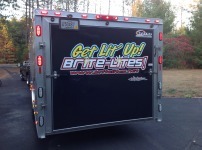 The entire trailer was custom built with the Brite Lites brand LEDs in and out. Here are the side lighting features on our new trailer. 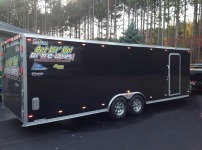 It is a 24' sidewall, 8.5' wide car hauler with Brite Lites LED Trailer lights everywhere we could put them! We used the surface mount snap-in rectangles for maximium light and a slim sleek look. The Midship oval is also a surface mount flange unit to keep the sidewall strength.